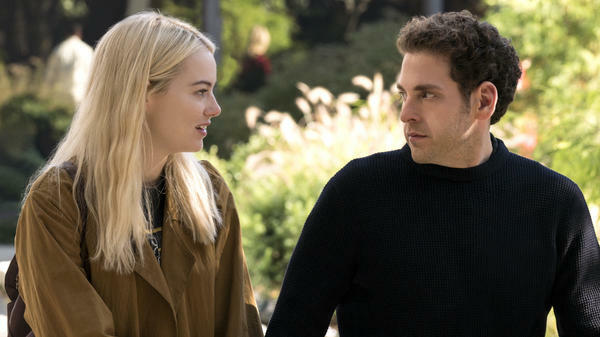 Emma Stone and Jonah Hill in Netflix's Maniac. Television and film set in dreams and hallucinations struggle with the fundamental limitations of the rational mind. Too often, what people experience as visions in TV and movies aren't strange enough. They're slightly bent, but not as off-balance as real dreams and hallucinations tend to be. Maniac, Netflix's new 10-episode series that originates with scientific trials of psychoactive drugs, spends a significant amount of its screentime in artificially induced dreams. Stars Emma Stone and Jonah Hill play Annie and Owen, differently down-on-their-luck test subjects who enter a round of experimentation that looks like wacky scientific experiments often do: put on a gray jumpsuit, take a pill, get in a chair in a sterile room, be strapped in, have something clamped to your head. We are in the hands of creator Patrick Somerville, who wrote for The Leftovers, and Cary Fukunaga, one of our most exciting directors. His distinctive style in 2014 made True Detective appear to be, in retrospect, somewhat more than it really was. Owen is miserable and rich; Annie is miserable and poor. But both have reasons to want to take the drugs that the very weird Dr. Mantleray (Justin Theroux) promises can fix the mind by inducing a series of "experiences" within it. For initially unclear reasons, Owen and Annie, despite having met only briefly before they go under, wind up inside each other's dreams. They share visions of both a working-class marriage and upper-crust capers before they begin to wonder why they're connecting and what they should do next. Meanwhile — and believe it or not, this is weirder than the part where Owen turns into a bird (long story) — the extremely strange Dr. Mantleray is dealing with his therapist mother (Sally Field), who inspired the creation of his supercomputer and his drug regimen, which are meant to make the services she provides obsolete. (Sally Field, by the way? Still great.) His associate, Dr. Fujita (Sonoya Mizuno), seems at once under his spell and capable of manipulating him; we will learn more about her. Action drifts back and forth between the dreams of Owen and Annie and the almost Joe vs. The Volcano-like oddball drudgery of the lab in which their physical bodies are resting. Stone is built for this kind of project, having demonstrated in films as varied as La La Land and Birdman that she can be a classic leading lady or a grubby character actress, a girl next door or a glamour puss. In the vignettes that come from her dreams, she effortlessly shifts between identities, from '40s movie star to '80s fashion victim to high fantasy... elf-thing. She seems at home in every one, and differently interesting in each. Hill fares less well in the dream sequences. With one exception, his performances in these varied settings are similar across the board, apart from some awkward efforts to change his speech depending on the character he's playing. When he finally finds himself in a genuinely comedic sequence, when he finally gets a silly wig and a broader stylistic template to work in — you can see him relax, in his element and pretty funny. But he seems adrift in the dramatic elements of this story, despite the fact that he's done well in at least semi-dramatic film roles — he was nominated for Oscars for The Wolf Of Wall Street and Moneyball. Perhaps "low-key" is just not on his list of strengths; he wouldn't be the first. Everything in Maniac is bent; even the world outside the lab is full of near-futuristic but dingy technology (little bots that pick up dog poop) as well as uncomfortable glimpses at the direction of consumerism (the "ad buddy" is a chilling concept). There are elements of fantasy and comedy and tragedy, hope and the bleak belief that the world will try to squash us all. Its fundamental narrative — two people cast out within their own lives, thrown together against larger and more monstrous forces — isn't all that new, and nor is the concept of using wigs and props to let characters try out new identities in their minds. In fact, the whole thing is based on a Norwegian television series, also called Maniac. But the look of the thing, and even more the feel of the thing, feels fresh and off-kilter. Theroux's truly bad hair, Field's unwieldy glasses, the way some of the lab displays look like an '80s video game — not to mention Dan Romer's twitchy score, the production design by Alex DiGerlando (also credited with the glam Ocean's Eight), and some truly great and tense sequences in which Annie and Owen are questioned by Mantleray. It's not perfectly executed, but it's stylish and fun, and Stone is great. So strap in. So to speak.